You might ask yourself what took me so long to write about the grand finale of the Oscar Pistorius case: Firstly, I was pretty much knocked out by food poisoning last week that I ironically contracted eating at a hospital during a gender based violence training. Secondly, I did not really have any idea what I could possible write about. I felt everything had already been repeated a thousand times over in media: the majority of people apparently are thinking that Pistorius is getting away with murder and that the sentencing had been too moderate. Also, it has been discussed plenty of times whether Judge Masipa’s interpretation of dolus eventualis was accurate. Nothing of this has really sparked my interest, I have to admit. It was only until I recently interviewed the social worker Letlhogonolo* – who is working for an organisation that deals with offenders of domestic violence – that I found something stimulating to write about. Judge Masipa is a wise woman. The public’s outcry for revenge cannot be guiding the court. We should be thankful for that. As Masipa said, the dark ages, the times of “an eye for an eye”, are long past. The court has to go by the law and by principles of justice as well as restorative justice. Society has a right to atonement, though, and a right to be protected against further crimes. Masipa found a balance. Those who seek and demand revenge won’t be satisfied by Masipa’s judgement and sentence, of course. They are never satsified. There are millions of fire arms in South African households. It is an error to think that harsh and vengeful punishment will deter anyone from using their private weapon against another human being, be it in self defence or seemingly so. All those legal fire arm owners are convinced they are actually entitled to do so, as was Pistorius. I uphold my take that Reeva Steenkamp would still be alive if Pistorius had had no fire arm in the house. Look at the judicial system now. Oscar killed somebody, now they send him to prison, sorted. (…) And just those few times that I engaged [with the case], I would realize that this guy has got deep issues and it was inevitable for him to kill somebody. It might not have been Reeva, he might have killed somebody else (…) so he was a ticking time bomb. Let’s forget about the matter. Let’s look at the trigger down there, do you understand? As <inaudible> as South Africa, we are, especially our leading people, judicial people, government – we are saying he killed, 5 years imprisonment. He comes back. Guess what he does? The same thing (…) So, for example right now, everybody is all over, including me, how obviously that was a very light sentence for Oscar. How can they only take him for 10 months? (…) He could get out in 10 months. How can they do this? It’s an insult to us. But research has found that it doesn’t work because Oscar will say, okay, I know now killing somebody is, it will take me to prison. But it will not stop him from also expressing that low self-esteem in abusive manners, outside, at other people, other than killing, do you understand? He’s the type of a guy who would get into a relationship and cheat and does not care because I was giving you money, what do you want? I won’t kill you because I know if I kill you, I will go to prison. He knows that. But he has not understood it in terms of the other abuse, the insults he says to this woman in public, the criticism, the pulling, what not. Because we did not deal with the problem, we were satisfied with the fact that he was going to prison. But you would be more rehabilitated if you don’t go to prison, continue with your career and we deal with your target problem. But we are not ready to accept that approach. We want punishment. We want prison. We want that he is finished. (…) For me, I’m answering again, yes we can [reduce overall crime levels in South Africa], but only, if we join hands and fight forward. But that is something that is very challenging to attain. In the interview excerpt, it is presented as inevitable, that Pistorius would sooner or later kill somebody. This deterministic if not fatalist perspective highly stresses the importance of a person’s past for her future behavior and decision making, almost insinuating a predefined path. Following the approach of restorative justice, the questions that should be asked now are the following: What can be done in order to repair the relationships that have been destroyed due to the crime? In which ways can the offender be held accountable for the crime? How can the offender be prevented from committing more crimes in the future? How can, if applicable, victim and perpetrator both be reintegrated into society? the importance of the community in terms of crime prevention and response is taken into account. 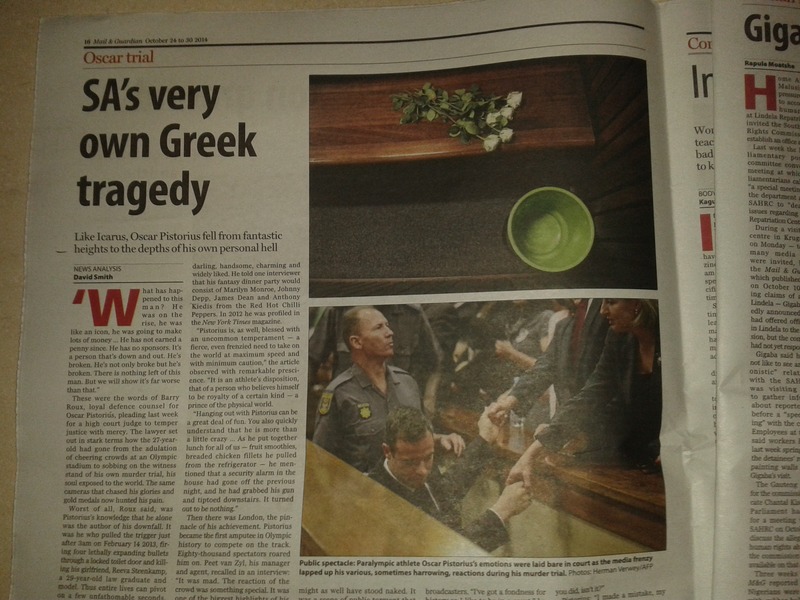 In another Mail & Guardian article dramatically titled “SA’s very own Greek tragedy” (Vol.30, No.43, 2014: 16) Pistorius’ rise and fall is summed up once again, this time listing various references that were used in media reports throughout the trial: “Much has been written about how this was a Greek or Shakespearean fall from grace. Pistorius is Icarus and Oedipus and Macbeth and Othello and Dostoyevsky’s Rodion Raskolnikov and Hardy’s Michael Henchard and Milton’s Satan ‘dropped from the zenit like a falling star’.” In addition to extensive media reports, the world was able to watch live how the athlete was dismantled in court turning interested spectators into living-room-judges. After all that has happened, is a restorative approach in this case still feasible? Or isn’t it rather that the whole media production of the case had ruled out the principles of restorative justice from the very beginning on in favor of sensationalism? What’s the verdict? Batley, Mike (2013): Restorative Justice in South Africa. In: Robert Peacock (ed. ): Victimology in South Africa. Van Schaik Publishers: Pretoria, pp. 115-128.